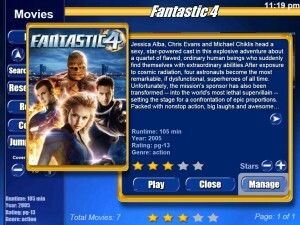 The latest release includes the long awaited movie star rating feature. Also the animated GIF images now work again in V3. In the skin editor, new keyboard shortcuts Ctl + Shift + [ will now move objects to the back, Ctl + [ moves objects backwards thru layers and Ctl + ] moves objects forward thru layers. – 0000672: [skin editor] CTRL + D Deselect (stevenhanna6) – resolved. – 0000586: [skin editor] Opacicty in skin editor not working, causes crash, stops skin from loading past screens in startup (stevenhanna6) – resolved. – 0000445: [skin editor] Add a short commande or a “click” button to set order of an element (stevenhanna6) – resolved. – 0000305: [animation] animated gifs don’t work (stevenhanna6) – resolved. – 0000186: [generic] movie rating system…1 to 5 stars (stevenhanna6) – resolved. – 0000671: [skin editor] CTRL + SHIFT + [ Arrange > Send to Back (stevenhanna6) – resolved. – 0000666: [generic] independent external web browser option (stevenhanna6) – resolved. – 0000670: [skin editor] CTRL + [ Arrange > Send Backward (stevenhanna6) – resolved. – 0000668: [skin editor] CTRL + SHIFT + ] Arrange > Bring to Front (stevenhanna6) – resolved. – 0000673: [skin editor] CTRL + SHIFT + I Inverse Selections (stevenhanna6) – resolved. – 0000674: [generic] expired demos no longer close down but will show a nag screen every half hour (stevenhanna6) – resolved. – 0000669: [skin editor] CTRL + ] Arrange > Bring Forward (stevenhanna6) – resolved. – 0000665: [skin editor] Closing skin editor “without saving “on menu page causes menu to show all menu items including those “unchecked” in F2 (stevenhanna6) – resolved. This entry was posted on Saturday, October 3rd, 2009 at 12:59 pm	and is filed under Uncategorized. You can follow any responses to this entry through the RSS 2.0 feed. Both comments and pings are currently closed.